Post-traumatic stress disorder is a mental health problem wherein an individual suffers anxiety due to an occurrence of a traumatic or terrifying event such as a serious assault, war or even a disaster. Guided meditation for PTSD is one way sufferers help manage their symptoms. Some of the symptoms experienced include anxiety, fear, shock, anger, guilt and nightmares. The majority of people who have encountered traumatic events often find it difficult to lead a better quality of life. However, with adequate self-care, and support, PTSD can be lessened significantly. If you suffer similar symptoms and have been the victim of a traumatic event, talk to a professional and seek help before attempting any guided meditation for PTSD and only use meditation after speaking to a doctor or counselor who has advised you. 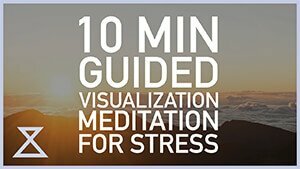 Guided meditation for PTSD can come in two forms. 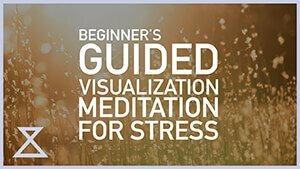 The first being visualization meditation which walks one through a series of imagery that can ease and relax someone, especially if they’re currently suffering from one of the many symptoms of PTSD such as intense anxiety and restlessness. The other form of meditation uses mindfulness, which helps one observe their own thoughts and emotions non-judgmentally. This can help a sufferer distance themselves from their suffering and look at it objectively, instead of allowing the suffering to consume their thoughts and actions. People who suffer from PTSD often try to avoid visiting places that might trigger them or meet with people that remind them of the trauma. By doing this, they can mitigate anxiety. In addition, a sense of detachment and isolation begins to develop in the minds of a person. Some of the physical symptoms experienced by them include a rise in blood pressure, nausea, and diarrhea. What does the term complex PTSD mean and when should one talk to a therapist? Some people who experience traumatic events such as witnessing violent deaths, victims of sexual assault and child abuse are usually diagnosed as having complex PTSD. Despite all these issues, a majority of these victims can succeed in overcoming this type of mental health disorder with proper support and treatment. It is highly recommended to see a doctor or therapist if one is struggling to cope with this mental disorder. A doctor and professional can provide the necessary steps, support, and treatment for your specific issue, which can help reduce stress and put you on the road to recovery. Some therapists even offer guided meditation for PTSD. What are the three major neurological components of PTSD? Amygdala, which is an important part of the brain, is related to emotions. It helps in perceiving potential threats. If an individual has previously encountered trauma, the amygdala continues to stay on hyper-alert even to non-threatening stimuli. Hippocampus is considered to be a vital part of our brain since it helps in connecting and organizing different facets of memory. Its primary job is to track a memory of an event at the right time, place and context. The term Hippocampus is derived from the Greek words ‘Hippo’ referring to horse and ‘kampo’ meaning monster. It is a major component of the limbic system and closely related to feeling, emotions and reactions. The Pre-frontal cortex is an area, which covers a major part of the frontal lobe. It is a cerebral cortex, which involves crucial decision-making, personality expression and balancing social behavioral patterns. It is broadly classified into various regions like dorsolateral prefrontal cortex, ventrolateral prefrontal cortex, orbitofrontal complex, frontopolar cortex, etc. The Pre-frontal cortex helps you to execute complicated tasks at times of emergencies. It is not fully developed until one is around 25 years old. Post-traumatic stress disorder is a serious mental disorder, which has affected many people across the world. Even though there are interventions, such as guided meditation, that display clinical effectiveness to cure PTSD, it can still be a challenging disorder to overcome and requires a lot of support, effort, and persistence. If you’re looking to use meditation to help manage PTSD symptoms, it’s best to first talk to a doctor or therapist who is familiar with dealing with trauma using meditation. One of the benefits of looking to a professional therapist is that they offer assistance in bringing down the intensity as well as frequency of nightmares, fear, anxiety and flashbacks. Meditation can help do this as well, sometimes just as effectively, with the proper guidance and training. Meditation can help bring one down from a hyper-active state, which is usually induced after encountering a trigger for their trauma. Additionally, meditation is helpful in reducing the stress hormones and triggering the functions of the parasympathetic nervous systems. This can help manage some of the symptoms of PTSD, including the physical symptoms, and other symptoms such as feelings of stress and anxiety. Finally, meditation can help with the long road to recovery. It allows one to sit and observe their mind. One can begin to see just how hectic the mind can be, and one can begin to see how much the mind tries to wander, even when we’re attempting to focus on the task at hand. 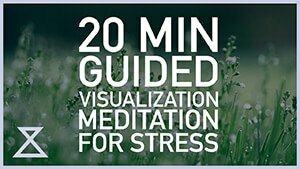 Using guided meditation for PTSD, one has access to an easy to reach teacher in their pocket or laptop, whenever they feel the need for some relief and comfort. While the symptoms of PTSD can be potentially cured, the memories associated with the trauma may never go away. However, with proper treatment and help, how one allows those memories of trauma affect them can be changed for the better. There are also prescription medications that can help manage symptoms, which can make therapy and recovery much easier for those whose condition is not improving or even worsening. Regular intake of antidepressants such paroxetine and mirtazapine are some prescribed by doctors to PTSD patients. 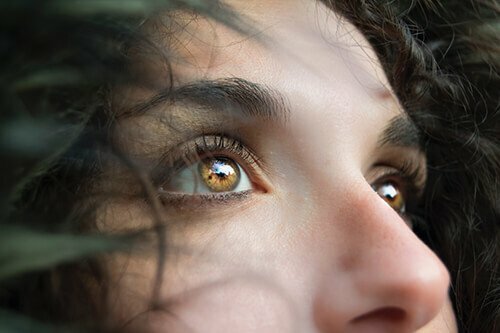 Finally, there are some psychological therapies like trauma-focused cognitive behavioral therapy, eye movement desensitization and reprocessing (EMDR). help you form the habit of a regular practice, and expand your mind to the teachings of mindfulness. Our meditation app is currently in early access until it launches. Declutter The Mind and our guided meditations.